Majority of the applications that reach the Google Play Store have a lot of hard work gone into them and while you are not aware of the developers and the hardships they have to go through, they certainly do exist. You have seen stuff like theme engines rolling out from nowhere and many different applications that might not appeal to your average Android user but that’s because they are niche applications. 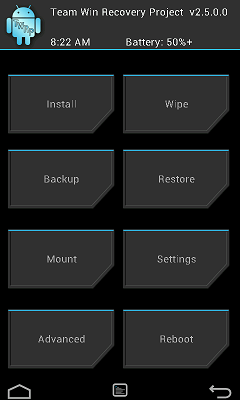 One such application is the TWRP that has reached the version 2.5.0.0 now, thanks to the hard working developers over at the XDA. The Team Win Recovery Project (TWRP) is all about recovery images and the mechanics involved in those are in a state of constant evolution since the hardware and software capabilities of our devices change every day. This particular application is an open-source project that has been around for a really long time now; couple of years to say the least. If you are into rooting and all, you must be familiar with CWM etc. In that case, you should know that this application is an amazing alternative to the Clockwork Mod. It adds a lot more functionality and looks good too; the changes made to the application make a lot smoother and the overall experience a lot more enjoyable. You have options such as install, wipe, backup, restore, mount, settings, advanced (settings) and reboot. In the previous versions if the device would go to recovery, the screen would turn off allowing you to save some juice. A bit more detail has been added to this concept and now you can change the screen brightness and select the timeout as well. Partition handling and selection has undergone major improvement with the scrollable list. Recovery modes don’t necessarily boast that entire amazing graphic horsepower one tends to have under the hood, but this one has a theme with a resolution of 1080 x 1920 for device such as Xperia Z and HTC One. What you must know is that this is still a newer version and is still undergoing development and testing so be warned that there might still be some bugs that you will come across. If you do install this, rooting a device such as HTC One will not be a problem any longer. If you do consider installing this application, please let us know what you think about it in the comments and also if you run into any major bugs or hindrances.